Emergency hospital admissions for people with Multiple Sclerosis (MS) are on the rise and costing the NHS millions; yet many of them could be avoided, according to a new summary of data by healthcare intelligence provider Wilmington Healthcare and the charity, the Multiple Sclerosis (MS) Trust. The information, which updates the authors’ previous analysis of English Hospital Episode Statistics (HES) from 2013/14, shows that emergency hospital admissions for people with MS in England increased by 12.7 percent over the two years to 2015/16. According to the latest HES data, there were 26,679 emergency hospital admissions for people with MS in England in 2015/16, compared to 23,665 in 2013/14, and this cost the NHS a total of £46m. 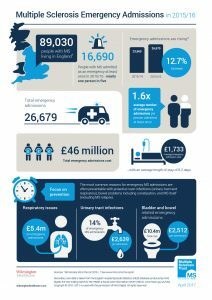 However, a large proportion of this emergency care was for problems which could have been avoided with proactive, preventative care and earlier diagnosis and intervention in the community. For example, the report found that urinary tract infections accounted for 14 percent of emergency admissions for MS in 2015/16 and they cost £2,639 per patient; while respiratory issues cost the NHS a total of £5.4m. Overall, admissions for bladder and bowel related issues for people with MS cost £10.4m in 2015/16. The report found that nearly one in five of the 89,030 people living with MS in England were admitted to hospital as an emergency in 2015/16. The average cost per admission was £1,733 and the average length of stay was 8.2 days. Sue Thomas, CEO of the Commissioning Excellence Directorate for Wilmington Healthcare, said: “Our latest report shows that the problems we highlighted in our original 2013/14 analysis have increased in the past couple of years. A growing number of patients with MS are being admitted to hospital for emergency care; yet many of these admissions could have been avoided with earlier intervention. Pam Macfarlane, Chief Executive of the MS Trust, which provides information for people with MS and supports MS specialist services, said: “It is disappointing to see that avoidable emergency hospital admissions for people with MS have continued to rise in 2015/16. What will capitated budgets mean for NHS spending? Trusts not meeting financial targets. Are providers spending within budgets?